Recently I was a guest on the blog talk radio show Nocturnal Frequency. The hosts of the show Steve and Alex were talking about different odd creatures being reported around the world. At the very end of the show Steve told me he had an odd experience with a strange creature on a Bridge. The show ended before I could find out exactly what happened to Steve. My curiosity got the better of me and I called Steve to find out what he had seen while crossing a bridge in Canada. First let me say that I have known Steve for a while now and have done a few shows with him. I have talked with him long enough to know he is a bright , logical man who looks at the subjects of the paranormal with an eye for understanding not fantasy . Steve is a level headed guy which is why I found his experience intriguing . Steve told me that during the year 2002 he was working a night shift job that had different shift hours during the week. Steve is also a hiker who takes advantage of every opportunity to be out in the world walking . During his work weeks he would have nights where his shift ended about 2:00 a.m. Steve would use these work shifts as a chance to walk home late at night when the world was asleep and the night his to enjoy. During one of these star bright lovely nights Steve's shift ended and Steve started his hour plus walk home. He listened to his music, enjoyed the beautiful clear quiet night and started his journey home. Steve's route took him across a river located near Mississauga in Ontario Canada. One night Steve set out for his long walk home after finishing his shift that ended at 2 in the morning which took him straight over the river. The river had a two lane bridge over it that Steve walked across on his trek home. The bridge had a grassy knoll down the middle of it that separated the lanes of the bridge. Steve was starting his way across the bridge when he noticed something ahead of him in the dark. He clearly saw some kind of large animal run from one side of the bridge into the middle of the grassy knoll. Steve stopped dead in his tracks and instinctively did not move at the sight of something in front of him that he could not identify. Steve stood motionless as he looked at the large silhouette in front of him. At this point the only thing he could distinguish was that the thing was very large. Steve stood perfectly still trying to see what stood about 30 feet in front of him in the dark . As he stood there peering into the night the thing in front of him began to rise from its four legged stance until it stood straight up as a human does on two legs. The thing before him was large , at least 6 feet 5 inches when standing fully erect on two legs. It did not take the stance of a bear or any other animal Steve had ever seen. It looked almost human when standing fully up and still. Steve could make out the semi human form of this thing as they stood there in the night peering into the dark at each other. Steve did not move . The thing did not move either. They stood still for what seemed a very long time to Steve but was only a minute or so. There alone on the bridge Steve stood with this thing peering back at him in the night watching and waiting to see what the other would do next. Steve could not make out if it had fur or hair or any features on this creatures head. The night would only silhouette the creature by way of the natural light that the stars gave off. It was Canada , near a wooded area over a very dark river in the middle of the night. Only Steve and this thing were to be found out at this time of night. All Steve could see was the dark strange shape of something he had never seen before. Finally the thing dropped down to all fours without a sound and took off to continue on its way across the grassy knoll to the wooded area across the other side of the bridge. Steve watched as this large creature continued on its way running in form somewhat like a dog would run. It ran into the woods back into the night. Steve stood there motionless for a few moments waiting and listening to see if the thing left the bridge area. He could not see it or hear any movement and carefully continued on his way across the bridge and away from this strange encounter. Steve felt he was being watched as he made his way as quickly as possible over that bridge and away from the area. Steve had no idea what he had just seen. He knew there were no bears in the area. The animal was far too large to be a dog or cat type of animal. He did not know of any animal that size that was able to stand erect like a human yet drop to all fours and run like an animal. Steve was also haunted by how this thing looked when it stood up on two legs. Its body was proportioned more like a human form than an animal form. The thing did not have shorter thin looking legs with a longer body like a deer. The thing did not have the silhouette of a bear. It was far too big and looked nothing like a large dog or cat. Steve knew he has just seen an unknown creature and felt shaken to his core. Steve has never forgotten this encounter . He has considered over the years trying to form an investigative team to find out what exactly it is that may be living in the woods in that part of Ontario Canada. 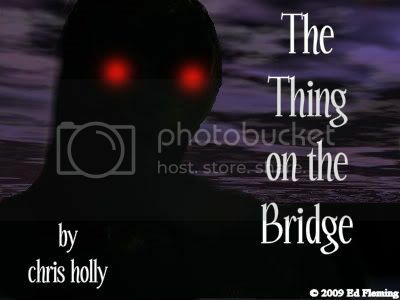 Steve also would like to know if anyone else has ever had an encounter with a creature that fit the description of the thing he saw on the bridge that night. Steve and Alex host the blog talk radio show Nocturnal Frequency which can be easily accessed on the blog talk radio site. If you have any information concerning the thing Steve came across that night please log into the show and contact Steve. I have been receiving more reports than usual lately of strange creatures over the last year. I am presently trying to talk with a woman who sent me an image she drew for a group of people near where she lives. The people claim they are seeing a strange large creature in their pastures. The report comes from those living in middle America who are seeing a large vicious terrifying beast in cow pastures stalking the animals. They refer to this creature as the 'cow pasture monster'. I am trying to find out more about these sightings however to date find the people involved reluctant to discuss it. It appears to be obvious that we are seeing many things that can only be categorized as unexplained not to mention very strange. I know I often tell my readers to be careful out there as well as paying attention to their surroundings. I think now more than ever it is especially important to be alert and aware that there are many unknowns out there and it is only a matter of time we may all find we are the ones looking into the eyes of something we do not understand. The Unknown Will Stay Unknown Because We Like It That Way!